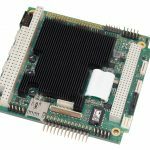 Low power Vortex86DX2 processor with up to 1 GB soldered-on RAM, Fast Ethernet, Mini PCIe/mSATA socket, and fanless operation. The Anaconda is a low power embedded computer designed on a standard EBX form factor. 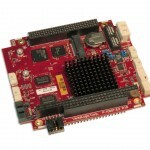 It is powered by a DMP Vortex86DX2 processor that enables the entire board to use less than 5.5W (typ.). Several I/O interfaces, multiple expansions buses, and thermal management options provide systems designers with flexibility and lower overall system cost.